The more time I spend on parental leave at home with my little man, the more things I find that I want to change or improve about the place. One of those things is decreasing the amount of wood! Everything seems to be wood; the doors, floor, kitchen, wardrobes, cupboards and shelves. I must admit upfront to not actually being a DIY person in the past, mind you I never had a house to DIY anything on though. But that isn't stopping me. 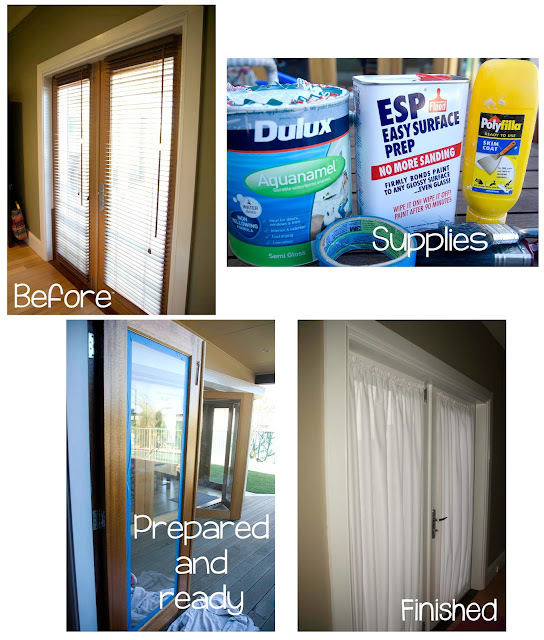 My first project was to give our bedroom's French doors a facelift. A trip to Bunnings to get supplies; paint, ESP, Polyfilla, tape and brushes. Easy Surface Prep, aka ESP, is the one of the best inventions. Simply rub some of this on the wood that you want to paint, wait 90 minutes and paint away. It removes the need to sand the wood so the paint actually stays on. Next step was to prep the door, so I applied the ESP to both doors making sure I got it into all the nooks and crannies. Otherwise the paint might peel off. I taped up the window edges as I tend to be a bit liberal with my painting strokes. I removed the blind, which I hated and threw in the bin so I Polyfilla'd the holes it left behind and sanded them once it had dried. I also removed the locks and door handles, making sure I put the screws in a safe place! Once the door was prepared, I enlisted the help of my little miss assistant and we painted and we painted and we painted. Three coats in total. A trip to Spotlight to get more supplies: material and a wire to hang the finished curtains. I then enlisted the help of my mum, who is simply amazing and would give Tonia Todman a run for her money, to make some curtains. Do you love French Doors? Do you love or hate DIY?